Just back from STS having been serviced & lightly restored, this lovely watch is losing out to my Baby PloProf for wrist time. 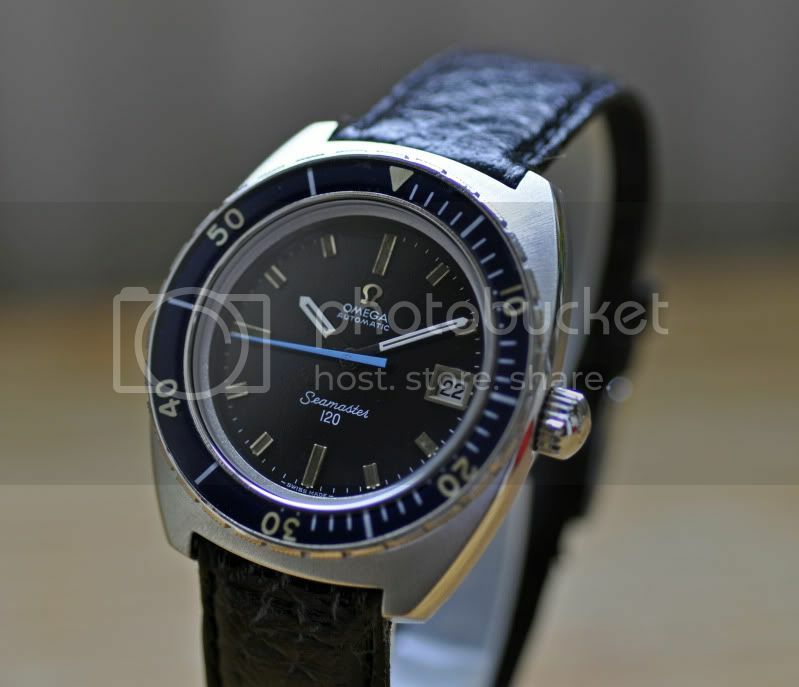 The dial is the original early version with just 120 under Seamaster rather than the 120m/400ft of the later version. There was some minor paint loss between 11 - 12 o'clock but that's been professionally touched up by STS. The original bezel is in amazing condition for the age of this watch turns and clicks just as it should. The crystal & case back were replaced by STS The previous case back was not correct for the watch (not enough thread) so it now has a NOS one that's nearest available to the original. The 38mm case was lightly refinished by STS. The original cal.1002 movement has been replaced with a cal. 1001 of the same age. The two movements are interchangeable with no modifications required. The cal.1001 (serial no. series 29'000'000 for 1969) which is actually a better movement than the cal.1002, is running strong, keeps good time and date changes properly. The hands are original & have been touched up. The blue second hand is really cool. The strap is aftermarket, but in decent condition & well suited to the watch. I asking just £775.00 for this one + buyers choice of postage with payment by bank transfer.